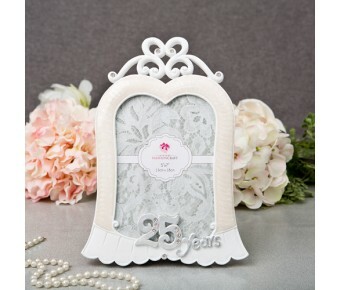 Stunning 25 years silver anniversary frame 5" x 7"
Gifts by Fashioncraft bring you a magnificent frame for a 25th silver wedding anniversary. We were enchanted by this frame and we are certain you will be too! A silver wedding anniversary is an occasion to be treasured and requires a very special gift. Our frame is fashioned from poly resin in epoxy and white tones. It offers a gloriously ornate shape with an openwork top and a scalloped border along the bottom. The words '25 Years' are finished in brushed silver and decorated with rhinestones on the numbers. Clear stones embellish the frame adding extra sparkle. When your clients come looking for the perfect silver anniversary gift, they will be delighted to find these frames on your shelves! Frame size is 10 1/2" x 7 1/2 "
25 years silver anniversary frame 5" x 7"
The perfect 25th anniversary gift!